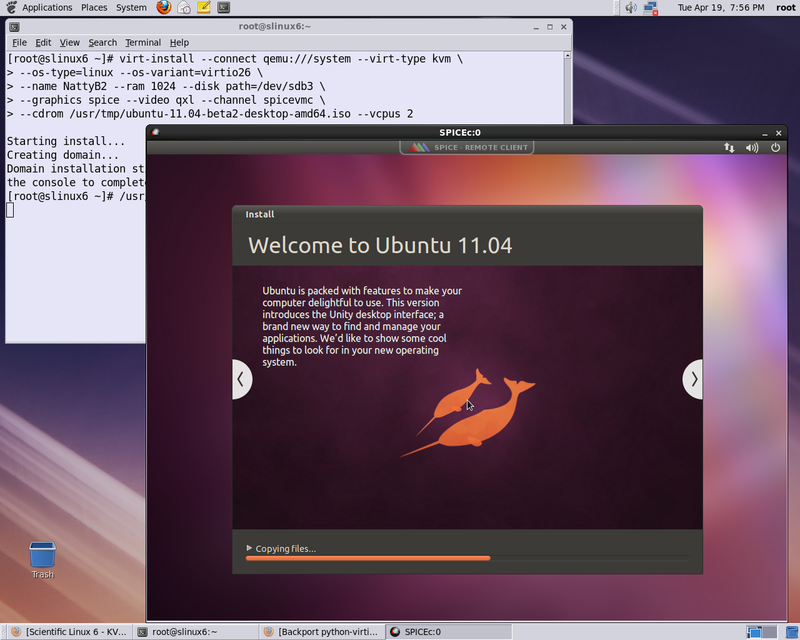 UPDATE on 09/21/11 Ubuntu 11.10 beta-2 will be released tomorrow. UPDATE on 08/27/2011. 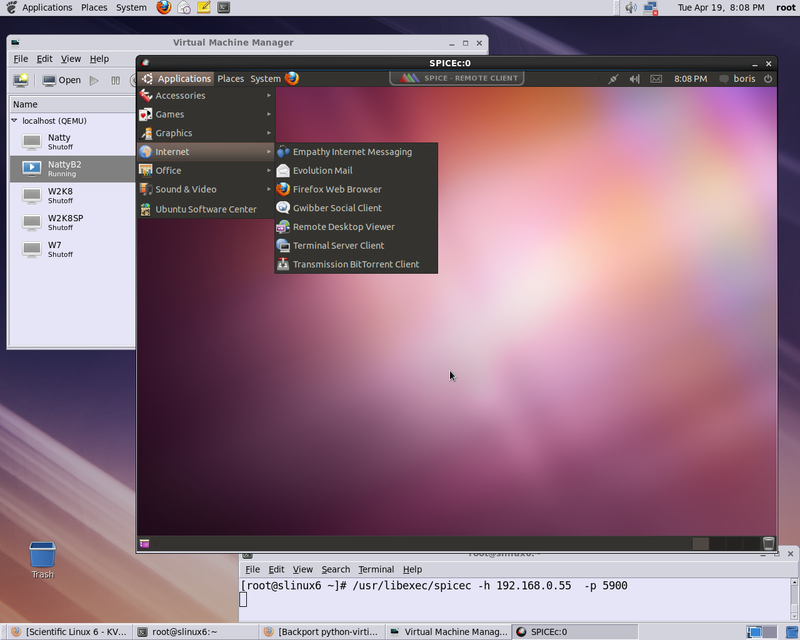 In meantime the best way to solve the problem on Ubuntu 11.10 (Oneiric) is to work via PPA Building Spice-Gtk-0.7 via Debian Unstable with Gobject-introspection enabled. 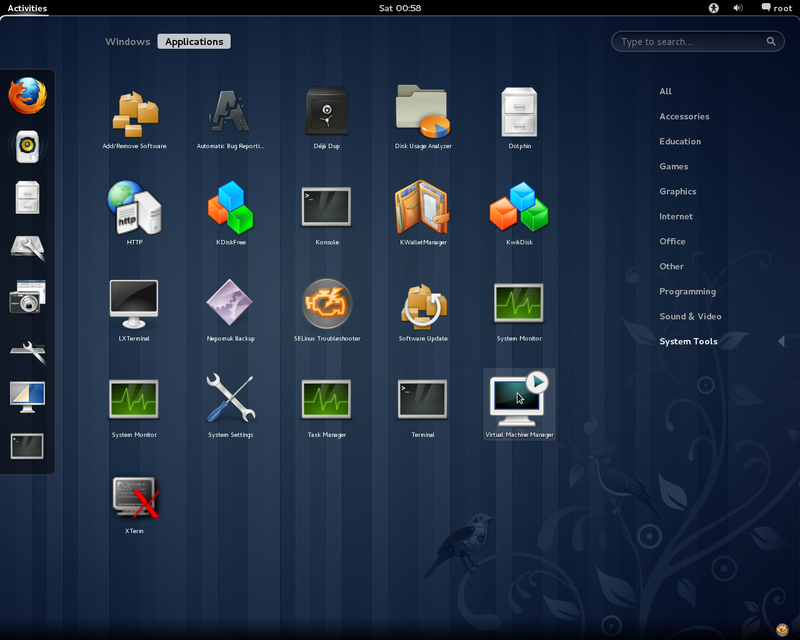 View for details Implementation Spice on Ubuntu 11.10 KVM Server the most recent approach. 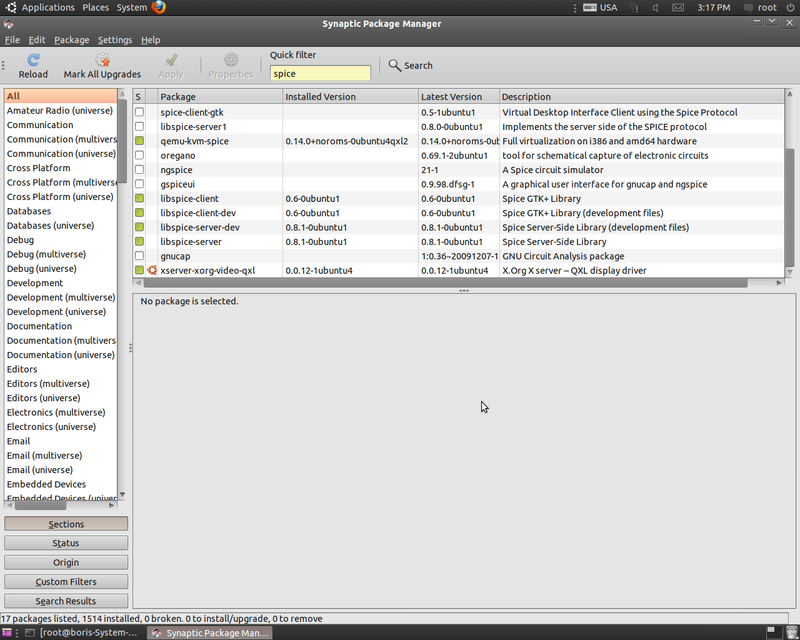 Packages from https://launchpad.net/~bderzhavets/+archive/test-deb2 installed with no conflicts on Oneiric daily build 08/27/11. 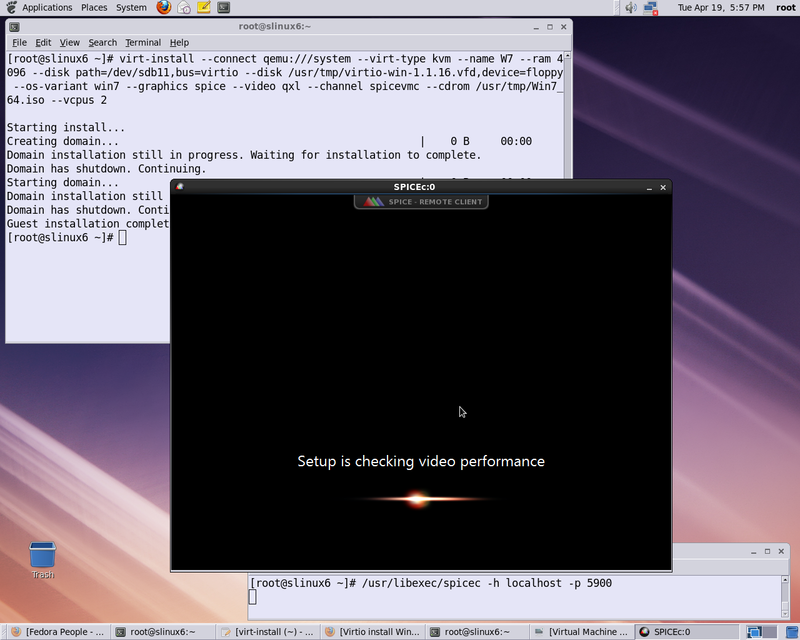 Spice sessions (via VirtManager) in QXL mode (64M vram) for install and for runtime have been run. 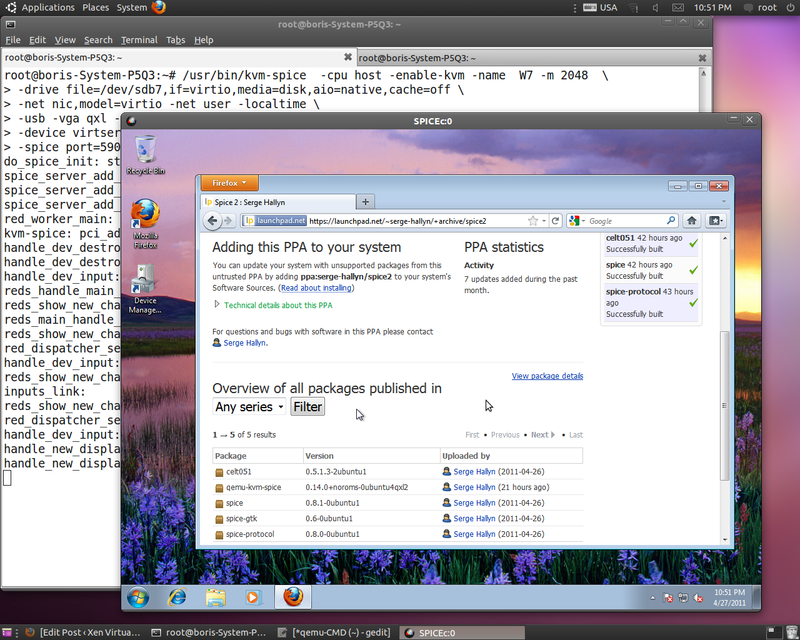 Packages installed via ppa:serge-hallyn/spice2 have been tested for F14, W7 KVMs installs and runtime. 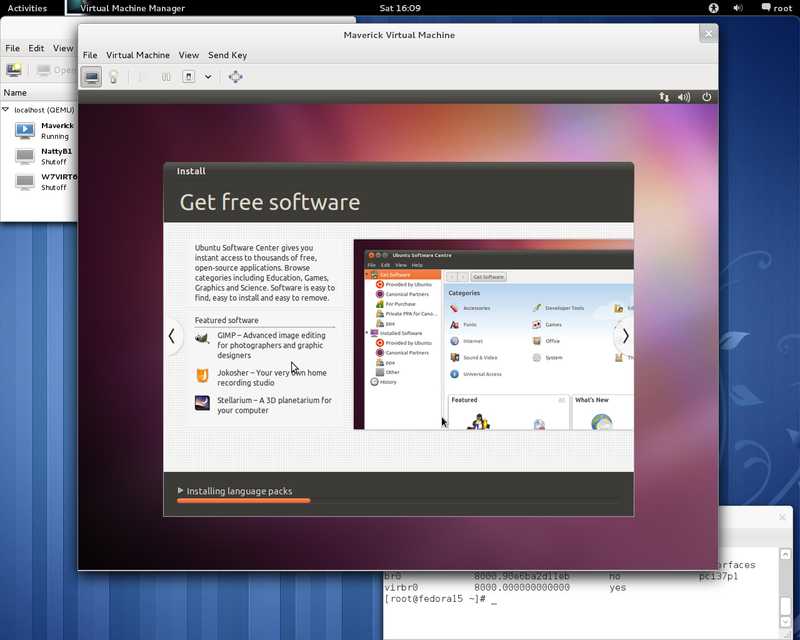 Package qemu-kvm-spice (0.14.0+noroms-0ubuntu4qxl2) is based on the most recent RH’s QXL patches sets for qemu-kvm-0.14.tar.gz. Disabling AppArmor’s profile for libvirtd allows to manage and create domains via virt-manager 0.8.6-1 installed on Ubuntu Natty Narwhal. 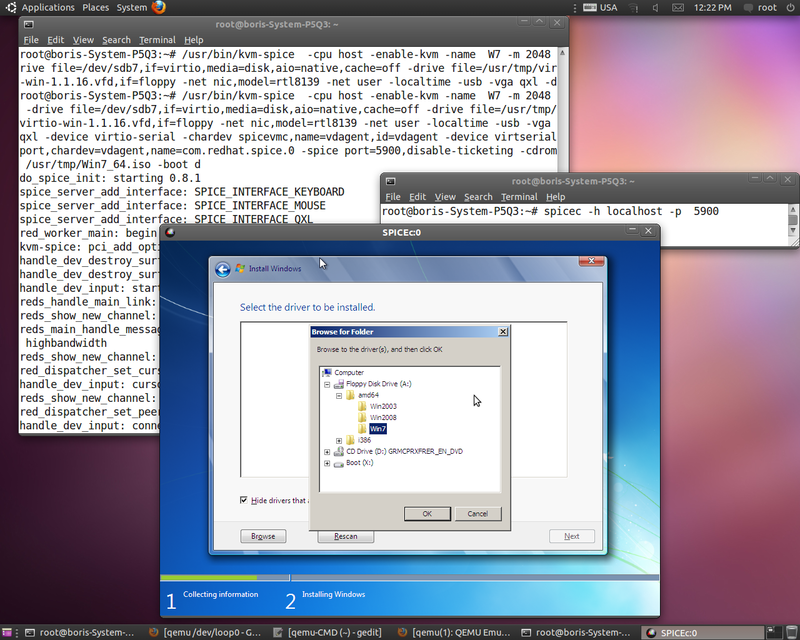 However, first domain install with option “-spice port=5900,disable-ticketing -vga qxl” has been been performed via qemu-kvm command line keeping original restrictions in place. AppArmor’s restriction for libvirtd profile on Natty Narwhal brings us initially to qemu-kvm command line installation. and update XML definition of W7 as follows. 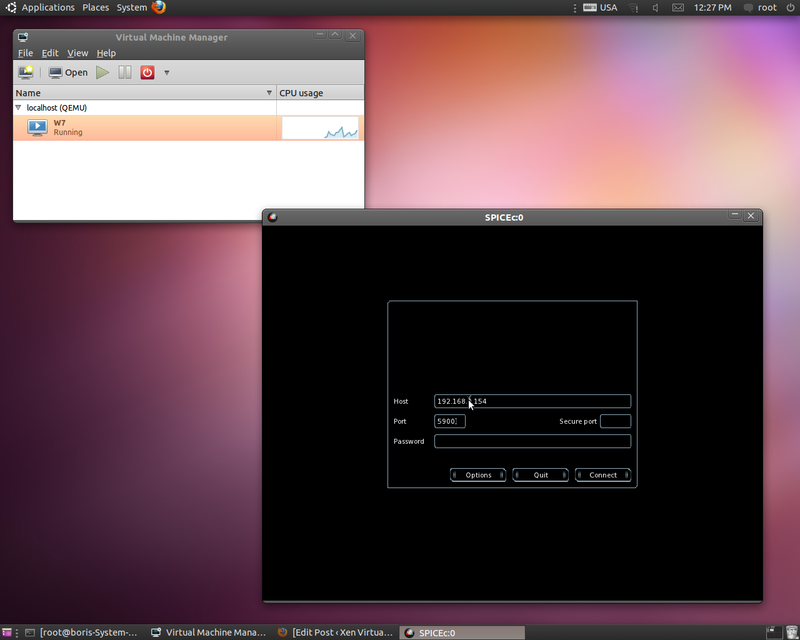 Actually at this point domains may be created in VNC mode via virt-manager 0.8.6-1. 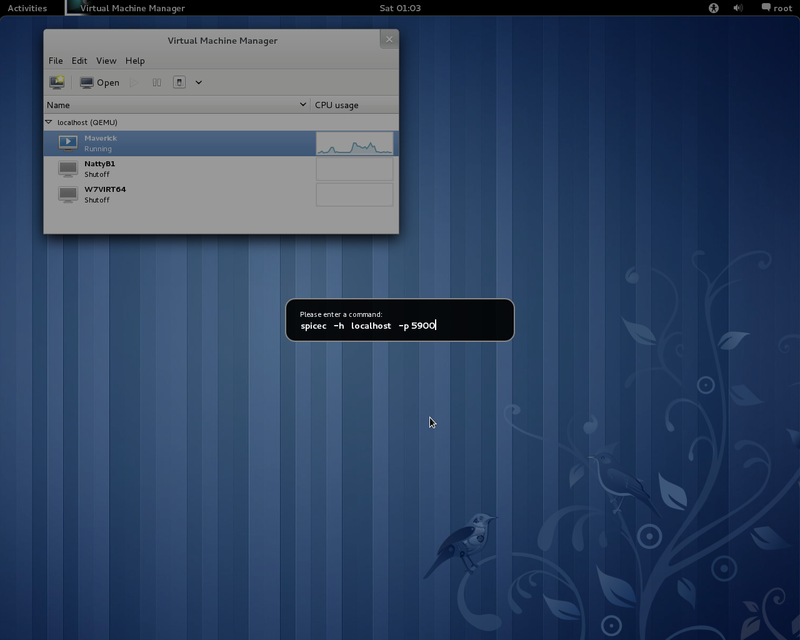 SPICE Server activated invoking “Add Hardware” wizard -> “Graphics->Spice Server , previously removing VNC Server. 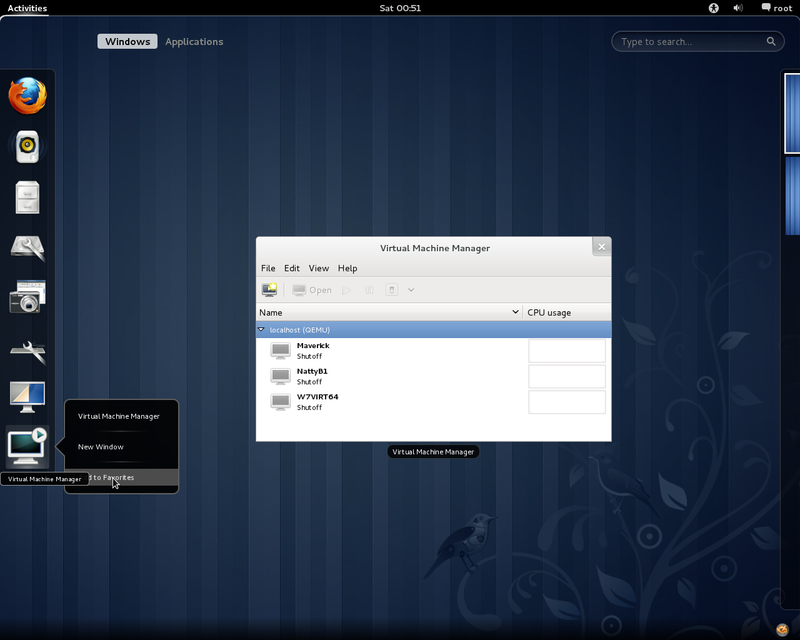 Switching domain to “QXL” mode is also possible via virt-manager. 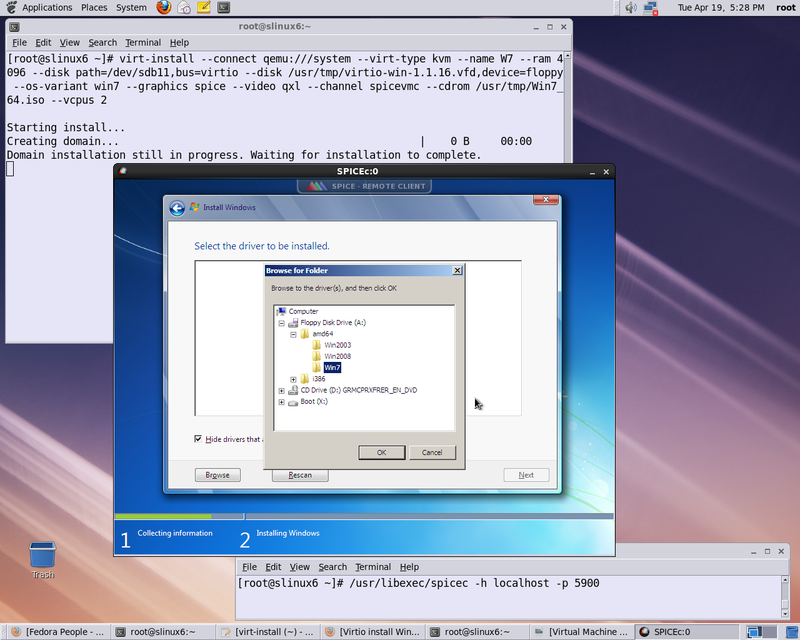 Primary target is to get virt-install supporting options “–graphics spice”,”–video qxl”,”–channel spicevmc”. 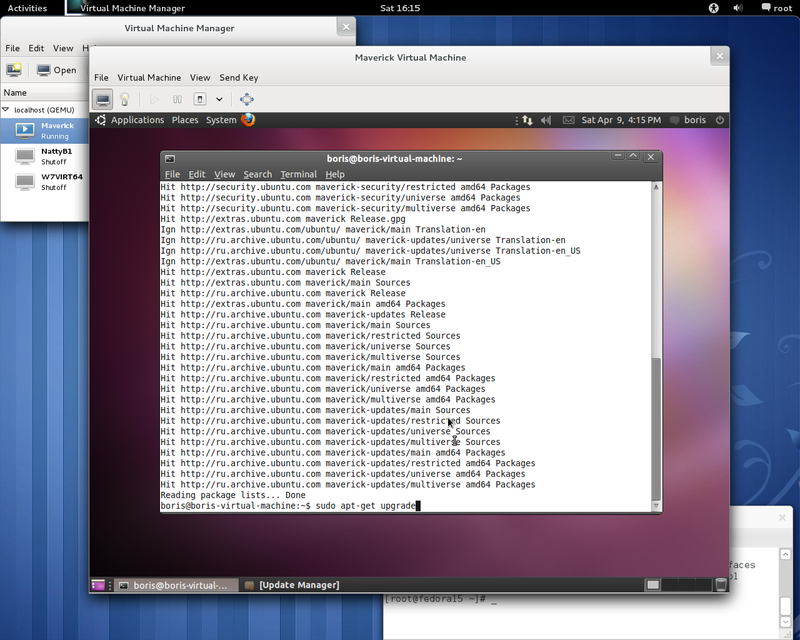 to avoid manual updating XML VM’s profile as suggested in . 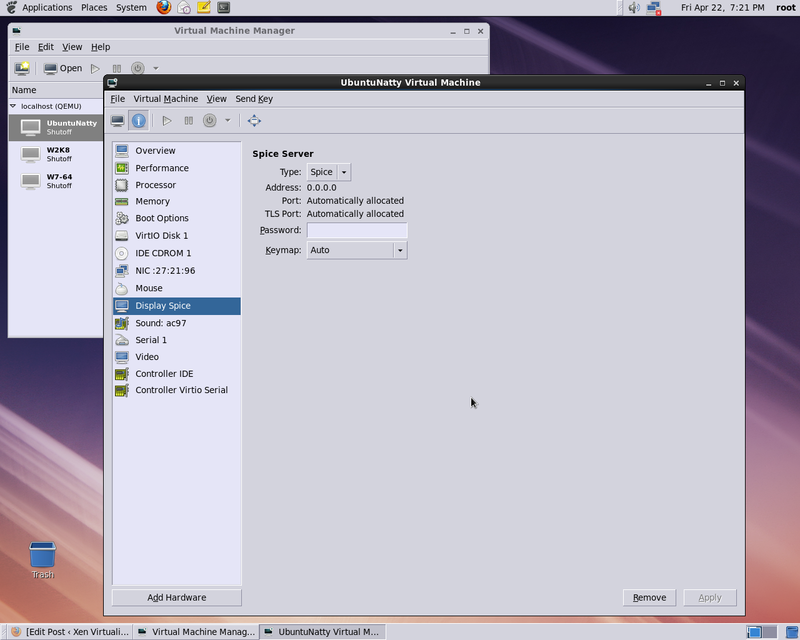 Following bellow is brief exercise managing Gnome 3 Desktop to create Ubuntu Maverick Meerkat KVM and run it in spice session.First of all after “yum update” i verified current “qemu” and “libvirt” status on Fedora 15. 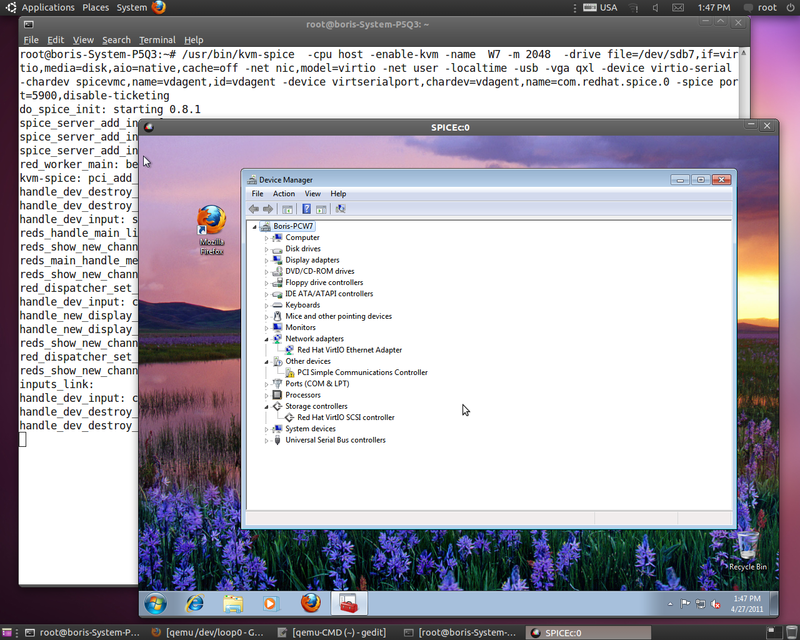 Virtualization Group has been selected during initial install. 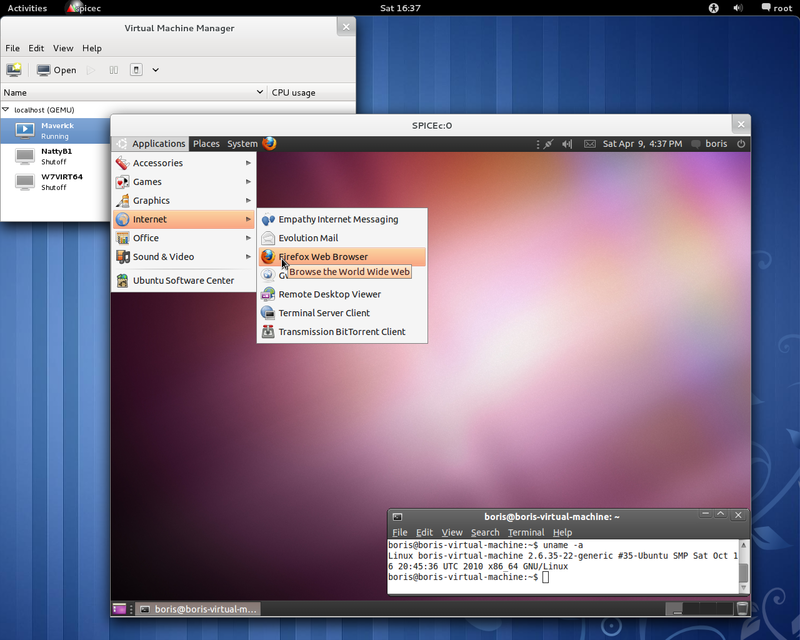 In this case Spice Display Screen will show address 127.0.0.1 and connection to via spicec will be available only locally. 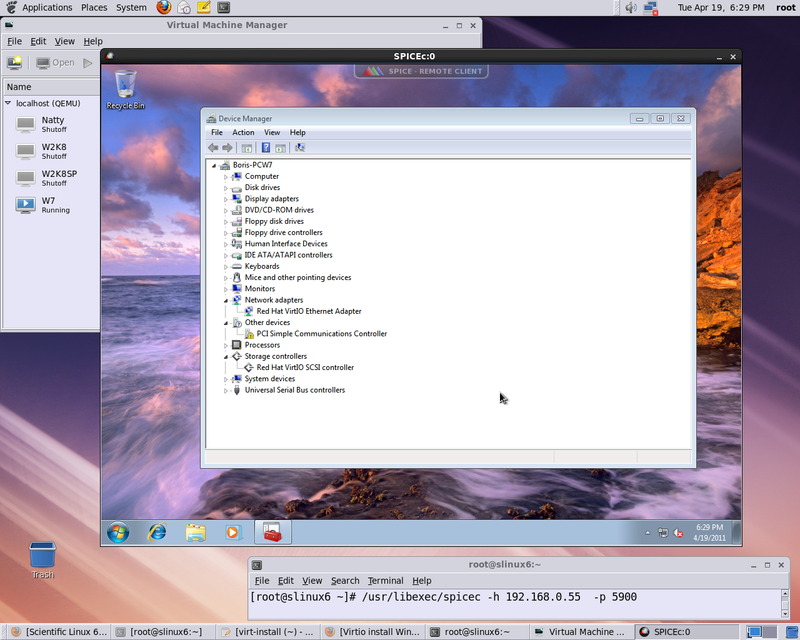 To get spicec working remotely remove Display VNC and “Add hardware” Display Spice. 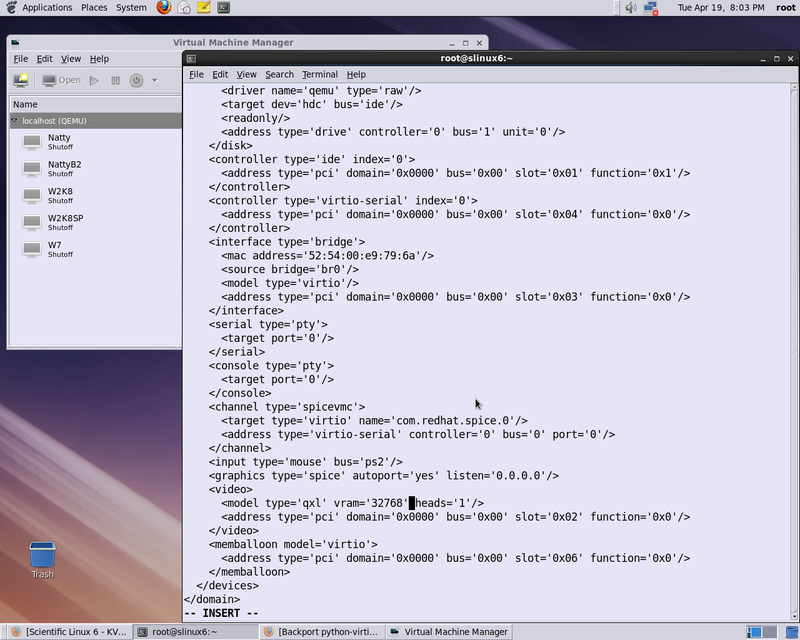 It will show you address 0.0.0.0. 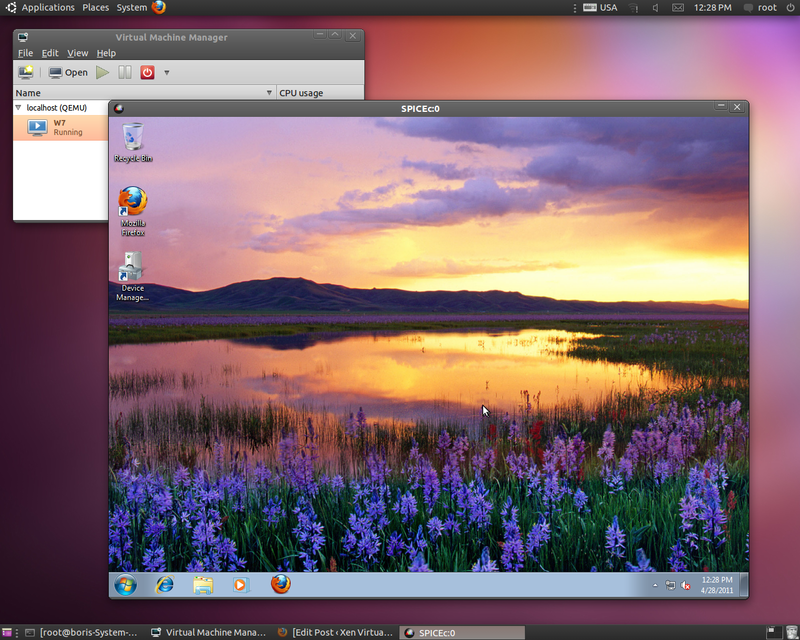 You are currently browsing the Xen Virtualization on Linux and Solaris blog archives for April, 2011.